On a hopefully peaceful day, here is a very short but sweet serene song from the great Romantic composer Johannes Brahms called "Contemplation". Contemplation is a song for violin and piano. Tales thanks Connell Media for this You Tube video featuring Emanuel Borak, the former concertmaster of the Dallas Symphony Orchestra, on the violin. 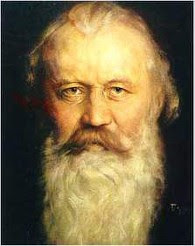 Please turn up the volume and relax and enjoy this short but nice piece from Brahms.